We feel so blessed to be able to have a baby. 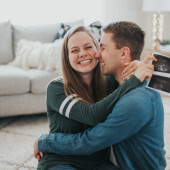 We are so excited to meet our bundle of joy! We are not finding out the gender until the day of the baby's birth, so we will be taking care of the clothes for the baby after it is born. We are so grateful for your support in welcoming our baby into this world.